In honor of those 3 events, I decided to do what I normally do when I’m in a great mood: attempt to craft a meal so elaborate that it actually makes sense for me to put on an apron. I don’t buy meat often. This is not a health thing, I just don’t particularly love handling the stuff and I get irrationally stressed out about overcooking it. It is also expensive, and we have already established that that is a problem for me. I cooked the steaks on an apartment-sized, charcoal-fueled cast iron grill (compliments of my meat loving father), but if the weather had turned sour I probably would have gone for my usual “4 minutes per side on the stove in hot pan with plenty of butter” method. The key to steak, I’ve learned, is not where or how you cook it. It’s the seasoning. There are two things I always remember when cooking red meat: 1) Add more salt than seems healthy and 2) buy garlic powder, NOT garlic salt, and go nuts with it. Let the seasoning sit on the meat for a bit before cooking and you’ll thank me later. The other dishes were inspired by a mix of experiences. The eggplant is variation of something Marc’s mom makes; the broccolini “salad” was on the menu at Sotto, an Italian restaurant in Cincinnati, and I fell in love with it. And the mushrooms? That’s a Franke household staple right there. The eggplant is simple and so, so good. Cut up an eggplant, skin on and seeds in, into bite-sized cubes. Sprinkle the cubes with sea salt and let them sit for about 10-15 minutes. Drizzle a good amount of olive oil into a small saute pan, put the heat on medium, and toss the cubes right into the pan. Sprinkle the eggplant with about half a teaspoon of oregano (or less) and some black pepper and cook, slowly, until they get delightfully shriveled and a little brown. Cut up a few sundried tomatoes and sprinkle on top and you’re golden. The broccolini is even easier. I really love this vegetable because it does exactly what you think it’s going to do. Just as veal is to beef, broccolini is to broccoli. It’s more tender and more willing to take on the flavors surrounding it. And burrata? It’s like mozzarella’s sexier, sluttier cousin: a cream-filled ball of pillowy cheese that’s salty and addicting and oh-so-delicious. To make this “salad,” (ok, I know the quotation marks are getting annoying, but it’s hard for me to call this a salad) simply blanch the broccolini in a large pot of salted, boiling water for about 2-3 minutes. Drain and flush with cold water and then sprinkle with olive oil. 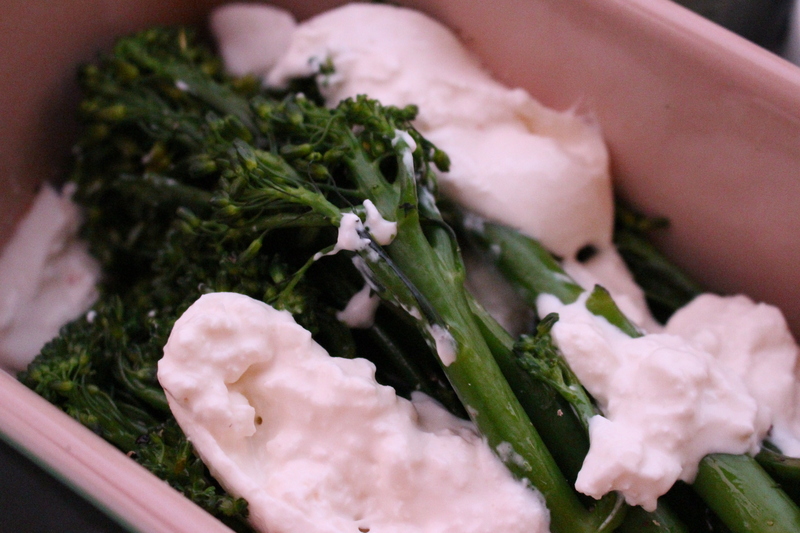 Loosely chop the burratta and lay it on top of the broccolini. Add black pepper and yeah, you’re done. 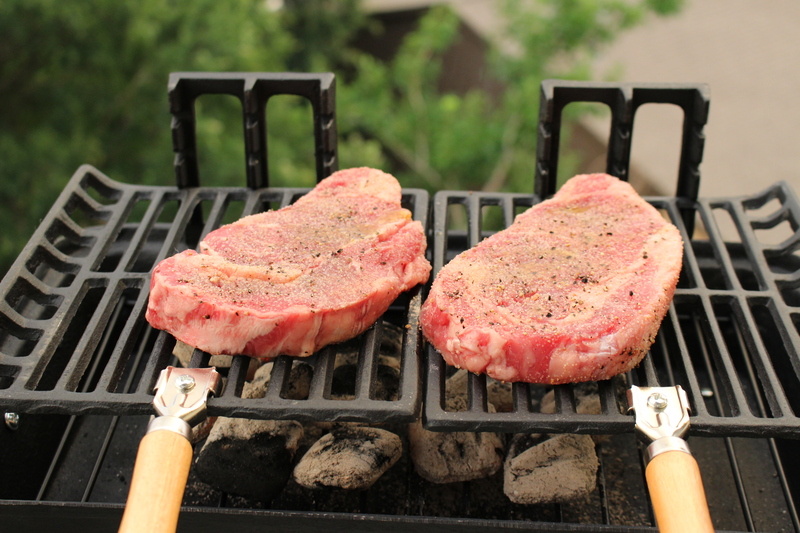 I overcooked the steaks on my new grill, but we were having such a good time that we hardly minded. Growing up, eating outside just as the sun was going down with good music playing was pretty standard most nights of the week. If I can make that happen here in Austin on my tiny studio balcony on a semi-regular basis, I think I’m doing all right.